Sometimes those latches can be difficult. Thank you for posting this, Leatherfoot! For some reason I love seeing men helping each other with their gear. I think it might be a male bonding thing, in the spirit of apes grooming each other. Many years ago I saw two young bikers in a parking lot getting ready to ride. One stood while his buddy crouched down to help the first on with his leather chaps. 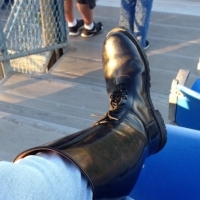 I want to say both wore tall biker boots as well -- so you know it must have been quite awhile ago. It was a sight to behold and remember.